Homerton High Street wouldn’t be the first place you’d think to look for a Grade II listed Tudor manor house! ‘Hidden Gems’ tend to be hidden gems for about a fortnight. These days social media tends to ensure notoriety amongst audiences in next to no time. So when you actually stumble upon a little known venue that’s worthy of ‘Gem’ status you’re torn between telling all your friends about it or keeping it all to yourself! Some spots just need to be talked about though and Sutton House is precisely one of those venues. Homerton High Street wouldn’t be the first place you’d think to look for a Grade II listed Tudor manor house but there proudly sits Sutton House which was built in 1535 and nowadays is part of the National Trust’s portfolio or properties across the UK. The most recent addition to Sutton House is Breaker’s Yard a site which sits adjacent to the house itself and was formerly a car breakers yard (hence the name!). One of the co-founders of the National Trust, Octavia Hill, campaigned throughout her life for fantastic outside spaces in inner London. The Breaker’s Yard is a modern interpretation of that vision and a brilliant example of how former scrub land can be transformed into a cultural and creative hub. The yard has been created by arts based educational charity The House of Fairy Tales and was partly funded by the Mayor’s Pocket Parks initiative which aims to turn 100 underused urban spaces across the city into oases for the local community in question. The House of Fairy Tales was created by artists Deborah Curtis and Gavin Turk and is an arts charity that provides young people with a space to imagine new narratives and explore ideas of sustainability all whilst being creative. The charity and Sutton House have worked with people from the local community throughout the development and will continue to be involved now it’s open to the public. The result is an urban oasis and the theme for the space is the late 20th century with perhaps Daniel Lobb’s The Grange as the most prominent and striking piece on display. 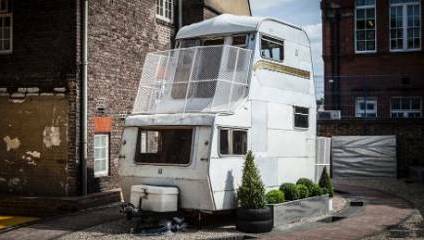 The Grange’s interior is a stately home, the only difference being that the exterior is a multi storey caravan sculpture formed from numerous scrap caravans. Sat alongside The Grange is an ice cream van which also serves up some feisty refreshments. Placed centrally in the yard amongst an edible garden, additional art installations and innovative design pieces it’s hard to believe this is former scrub land and all the items within it have been recycled to transform the space which unfolds before you. Now it’s open, The House of Fairy Tales will also be working with local families and school children in East London to use the space as part of a playful learning programme. As a community venue it has an awful lot to offer and it hosts a huge number of family events, dance evening and film screenings across the year to fulfil the desires of an eclectic audience. As well as being a museum it also houses a café, art gallery and book shop and even hosts the odd wedding on occasion. So, for all those people who love one of the following; beautiful historic houses, eclectic and cultural outside spaces, iconic East London venues, community hubs, educational spaces, day trips, museums and even getting hitched then look no further than Homerton High Street. Consider it a hidden gem no more! For more information about Sutton House please click here.